Famous For: Mythology, History, Photography, Nature, Adventure, Architecture. Visiting Time: Any time during the day as per your convenience. Visiting Duration: 30 minutes to 1 hour. Rishikesh, as the name suggests, is the abode of the sages. Situated on the lap of the enormous and the mighty Himalayas, Rishikesh presents a fantastic view. As the sacred Ganges flows down the valley creating a rippling music of its own and nourishing the lush, green vegetation with its alluvial soil deposition, the entire hill station of Rishikesh is purified. One such manmade wonder is the Laxman Jhula that is built across the River Ganges. This bridge is historically and mythologically of great importance and is, thus, a very popular tourist destination in India. Try to visit this place early in the morning as it gets very crowded later during the day. Make sure that your camera is fastened in your bag otherwise you will repent afterwards. Cross the bridge on foot for an enchanting and a swaying experience that will make you remember your childhood days once again. Go for some adventure sports down the gushing river like river rafting and river crossing to skip a heartbeat and to feel the adrenaline rush flowing through your nerves. Professional guides are not available at the premises of the bridge. There are many local people who will eagerly help you out with anything that you require to know or to do. No matter which season you visit the place in, this place, that is, the Laxman Jhula, will transport you to a world of enchantment as you make your way around to this mythological bridge. 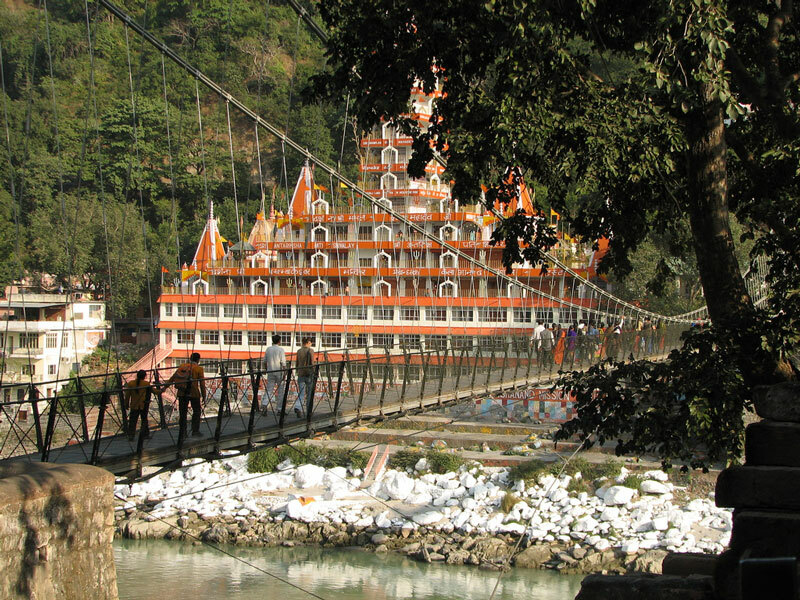 The Laxman Jhula is situated at a distance of 16.2 km from the main bus terminal of Rishikesh. In order to reach the iconic bridge, you can hire a private or a shared taxi. You may even board a public bus that would take you close to the Laxman Jhula. The Laxman Jhula was constructed from 1927 to 1929 and was opened for the use of transportation in 1930. According to the Hindu mythology, Laxman, the brother of Ram as enunciated in the Hindu epic “Ramayana”, had crossed the Ganges along this very spot by building a bridge with ropes. Thus, due to the mention of this episode in the epic, the man-made iron clad bridge has been named as the Laxman Jhula. This bridge connects two villages on either bank of the River Ganges, namely, Tapovan and Jonk. Rishikesh is the perfect abode for every traveller who is seeking both respite and adventure. Marked by the brilliancy of both nature’s bounty and man’s creativity, Rishikesh is a hot spot for tourism in India. 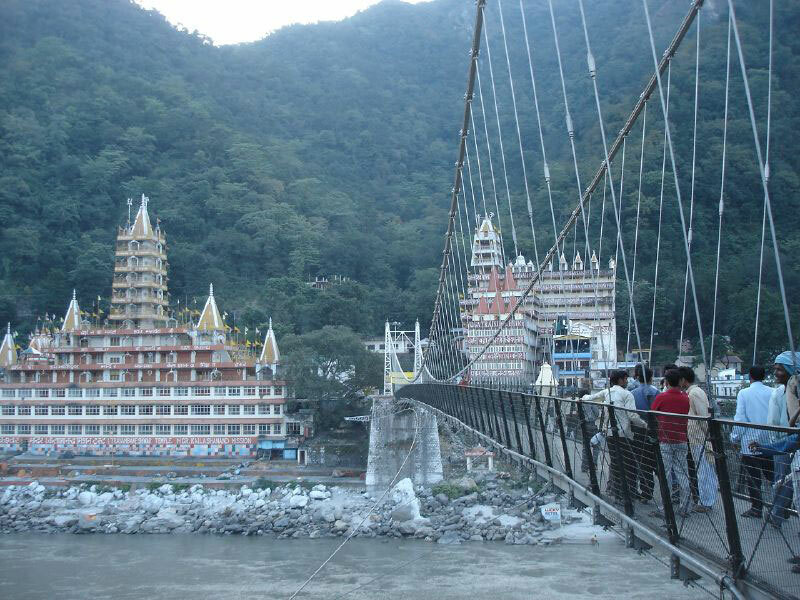 The Laxman Jhula, located in this very same place of Rishikesh, adds to the prolific environment of Rishikesh and stands high above the raring Ganges with pride. Thus, the Laxman Jhula that symbolizes power and connectivity is a must visit for all.